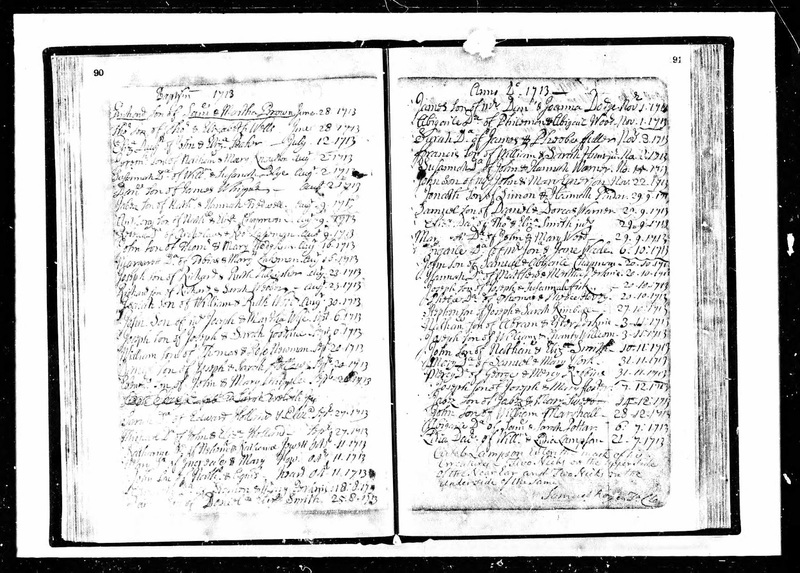 "Jerem^h son of Nathan^ll & Mary Knoulton Aug^t 2 1713"
Massachusetts, Town and Vital Records, 1620-1988, digital images, Ancestry.com (http://www.ancestry.com : accessed 23 August 2017), Ipswich > Church Records, Earmarks, with Births, Marriages, Deaths, page 90 (image 293 of 326), Jerem^h Knoulton baptism entry, 2 August 1713. Jeremiah Knowlton was the 5th and final child of Nathaniel and Mary (Bennett) Knowlton born in Ipswich, Essex County, Massachusetts. 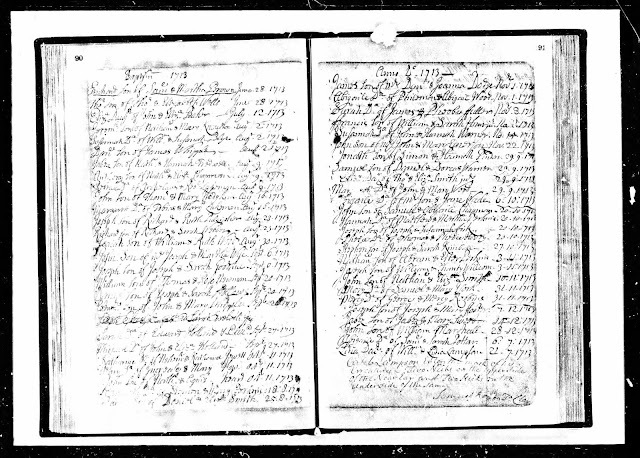 There are at least three transcriptions of the original town records in the "Massachusetts, Town and vital Records, 1620-1988" collection on Ancestry.com. The image above is probably the first transcription from the original records. So it is a Derivative Source, not an Original Source. Jeremiah Knowlton (1713-1742) married Sarah Allen (1717-1796) in 1735 in Sudbury, Massachusetts, and had five children born in Concord, Massachusetts. They are my 6th great-grandparents through their son, Jeremiah Knowlton (1745-1785), who married Abigail Peirce (1750-1776) in 1771 in Waltham, and resided in Lincoln and Weston, Massachusetts.